I remember seeing the previews for the Alvin and the Chipmunks movie, cleverly called 'the squeakquel' - well, I thought it was clever, didn't you? This wasn't a movie that I felt just had to be seen in the theater, but now it's coming out on DVD, so we'll most likely end up watching it. It's packed with action and nutty fun for the whole family - and cute little chipmunks, of course. There are even girl chipmunks in this one, the Chipettes, a beautiful talented trio discovered by Alvin, Simon, and Theodore's ex-manager Ian. I can just imagine the trouble the boys get into. I've been having some fun with the 'Get Munked with Alvin and the Chipmunks' application at munkyourself.com. You get to create your own chipmunk - choosing clothes, accessories, etc, and then record your own sound or choose a clip from the movie. I'm not sure what this clip was about, but it's exactly how I feel sometimes. Besides the 'munk' yourself thing, there's plenty More Munk Mayhem you can get into at foxfamilyflicks.com. There are games to play, downloads to download, and music to sing along with. Alvin and the Chipmunks: the Squeakquel will be available everywhere Tuesday, March 30 on DVD, Blu-ray and Digital Download. You can buy it now through pre-order. The Double DVD pack comes with "The Squeak Along" Bonus Disc, with more music, mayhem and all-new singalongs! TWICE THE FUN for the PRICE OF ONE! 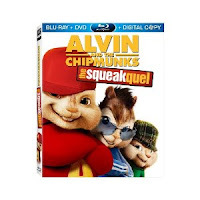 Check it out and see if this is one you want to add to your home movie collection - and have some fun with the chipmunks while you're at it. Weird how right about the time I was writing this post I got an email with the subject: "Dare to bring back family movie night"